Feeding Avery Families relies on many partnerships to provide high quality food for our clients. If you are interested in helping to provide support through donations of food, supplies or services, please contact us. MANNA FoodBank is a private, not-for-profit service organization, that links the food industry with over 200 partner agencies in 16 counties of WNC. MANNA is an acronym and stands for Mountain Area Nutritional Needs Alliance. We are a member of Feeding America, the nation’s largest domestic hunger relief organization. Together we can solve hunger. One of our biggest partners and donors is Food Lion in Banner Elk. Approximately 4-5 times a week, Feeding Avery Volunteers pick up food donated by Food Lion and take it to Newland to store until we distribute it each month. 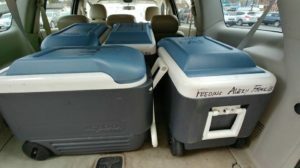 Here is a picture of 4 coolers of meat weighing 150 lbs that was picked up recently. In addition, there was over 50 lbs of bread and desserts. Thanks to Food Lion, and the volunteers that pick up their donations! Lowes Foods collects food donations for Feeding Avery Families from their customers all year round. Lowes runs special “Friends Feeding Friends” campaigns several times a year. For these campaigns, Lowes prepares bags with a variety of healthy foods, making it easy for their customers to purchase and donate. In addition, Lowes dairy department employees save the cartons that milk is delivered in for use by Feeding Avery Families for food distribution.